Depending on your dog’s needs and style of haircut – we recommend getting your dog groomed at least every 6-8 weeks. This will maintain a healthy coat and a good looking pooch! Dog’s nails can grow quite quickly, and can become a problem if left too long. We do trim nails with all of our grooms, but in between grooms we recommend getting them trimmed every 2 weeks. This can make the quick grow back into the nail thus giving your dog shorter nails over time. This means less clicks and scratches on your floors! Depending on the size of your dog, the length of the coat and the type of groom you have chosen, the time it takes to groom your dog can vary. We strive to have all grooms done in a maximum of 4 hours to lessen the stress on the dog. Should I brush my dog at home? Absolutely! Brushing your dog is a bonding experience that should be started as soon as you get the dog. Whether it is a puppy or a fully grown dog this is important not only to maintain a healthy coat between grooms, but it also establishes dominance. 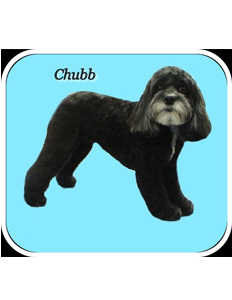 If your dog does not like being brushed at home this is likely due to the owner succumbing to the dogs whine or yelps. It is very important not to give up if your dog starts to struggle. This is an exercise that dogs like to use to be dominant over you (the owner). If they can get away with the brushing – what else can they get away with by whining or barking??? When should I first start getting my puppy groomed? When your puppy has been given its 2nd set of vaccination shots, the time has come to bring him/her in for the first trim! We recommend what we call an “Introductory trim” which includes a bath, brush, nails, face trim, ear and tail trim, sanitary area cleaned up and feet trimmed and rounded. We strive to make all of our grooms as stress free as possible. Should I bathe my dog between grooms? When bathing your dog at home please be aware that for longer haired breeds fully drying the coat is required so mats (hair knots) do not appear. Brushing while drying cuts down the drying time but make sure you use a proper slicker brush. We are equipped with all the proper equipment to groom your special pooch, so if you are unable to bathe him/her yourself please give us a call today! Is it alright to have my dog’s hair cut short for the winter months? Yes it is alright. Depending on your dog’s breed and coat quality, we will create a haircut suitable for your dog’s needs throughout winter. As they are completely covered in fur they never get as cold as we can out in the cold weather. We offer a wide variety of cold weather apparel to make winter an enjoyable experience for all! What is the best trim for my senior dog? Sometimes as your dog ages they experience many of the same problems we do such as sore joints, stiffness and arthritis. When this happens it is difficult for the dog to stand for long periods of time while being groomed, so we may suggest a trim that requires less time on the table and lower maintenance. We will always do what is best for your furry family member! Why does my dog shake when I bring him/her into the salon? Most dogs quiver and shake when coming to a salon and most often it is only related to separation anxiety. Rest assured once Mom/Dad have left, your pooch relaxes and enjoys his/her stay at the groomer! What is a hair mat? A hair mat is what results from lack of brushing/bathing of the dog’s coat. When a dog gets wet and is not dried properly mats will most likely occur. The only way to prevent them from happening is to brush your dog at least every other day. Nobody wants a naked dog so remember to brush-brush-brush!! !